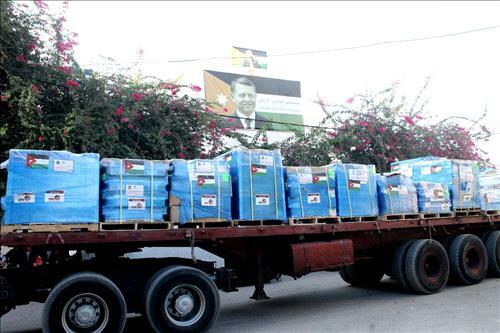 AMMONNEWS - A humanitarian aid convoy dispatched by the Jordan Hashemite Charity Organization (JHCO) in cooperation with the Jordan Armed Forces-Arab Army, arrived in the Gaza Strip on Monday via the King Hussein Bridge. The commander of the Jordan Field Hospital/Gaza 53, Col. Awad al-Hawadi, said that the aid aims at supporting the people of Gaza, pointing out that such convoys are dispatched on regular basis to keep the hospital functioning. "This assistance is but an expression of solidarity by the Jordanian leadership and people to help our Palestinians brethren in the enclave against the hardships they are facing," he added. Director of the hospital Major Ahmad Tayseer Al Zu'bi said the medicine and medical equipment dispatched by the JHCO were meant to help the hospital in providing services to the people in the coastal enclave, noting that the aid will contribute to upholding the medical sector and improving health services provided to Gazans.